Of all the things that I DIY’d this year my favorite has to be the bird wine cork ornament. Aren’t they just cute and whimsical at the same time? It was inspired by a similar ornament that I saw on BH & G where they made the bird out of a whole almond. I had to modify their templates to fit the narrower corks. I have posted the templates that I used here. Please feel free to download them for your use. Trace the felt cap/hat pattern from the template and cut the felt accordingly. Using three strands of embroidery floss blanket stitch the bottom edge of the cap. Fold the hat in half and with right sides together and whipstitch the straight sides. Turn the hat right side out and fill with cotton/fiberfill. Hot glue the cork to the cap. Stitch through the top of the hat with six strands of embroidery floss. Tie the floss ends in a knot for a hanging loop. 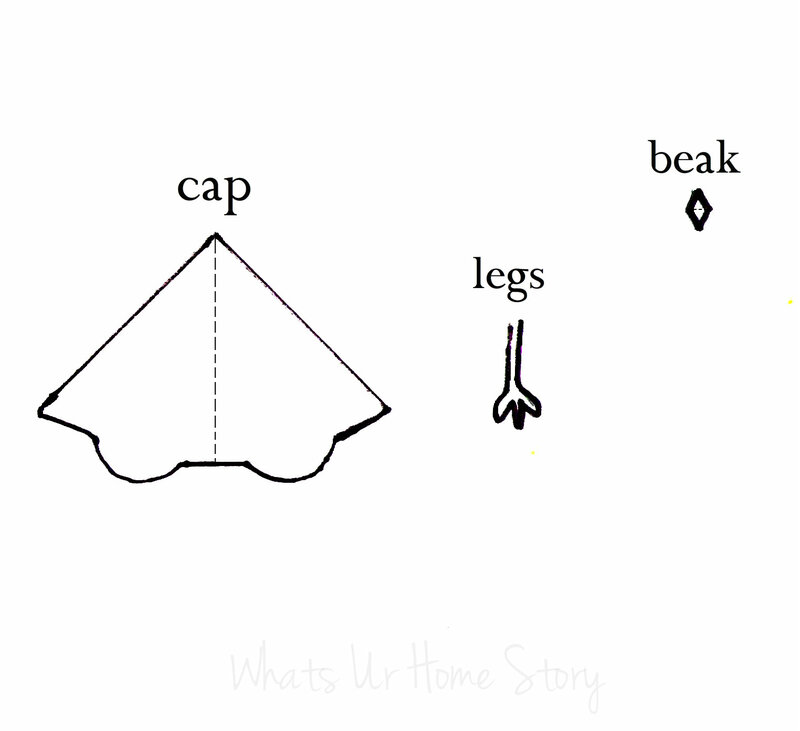 Cut a piece of craft wire and shape it into the legs and feet using the template as a guide. With an X-acto knife make 2 small slits in the cork where the legs would go and insert the legs into the slits. Hot glue the legs to the cork. Now hot glue the piece of twig to the feet. Cut the beak from the yellow craft paper using template and hot glue to the cork along with 2 pepper corns for eyes. And that’s how you make a wine bird cork ornament! Ready to meet the entire flock? My daughter wants to hang them in her room once we pack up there tree! Who knew wine corks could make such cute birds! They are so versatile that they look good just filling up a glass jar! Do you save up wine corks for craft too? What’s your favorite wine cork craft? Oh my goodness, these are adorable. There are so many great woodsy projects for the holidays this year and this is at the top of my list. Thank you! Glad you dropped by. Happy Holidays! oh my goodness! these are just the cutest, vidya! Thank U! Was super fun to make. So stinking cute! Love how they’re sitting on the branch and their hats!